The luxury watch brand Fossil had recently unveiled an Android Wear smartwatch in partnership with the famous National Geographic photographer – Cory Richards. Now, the company has come up with two new touchscreen smartwatches running Android Wear 2.0, dubbed as Fossil Q Venture and Fossil Q Explorist. Both the smartwatches are not priced very high; they retail between $255 and $275. Among the two, the Q Explorist features a bigger display with 44mm diameter and 12.6mm thick casing while the Q Venture comes with a 42mm screen and 11.5mm casing. Additionally, both the smartwatches also sport a digital crown which is placed on the right just like LG’s Watch Sport. The digital crown helps in faster movement through watch’s interface. Under the hood, both the watches come powered by Snapdragon Wear 2100 processor with 4GB memory. One of the shortcomings inside these watches is the absence of GPS and NFC. It makes them stand pretty small in front of other smartwatches like LG’s recently launched Watch Sport that comes with both NFC and GPS for Android Pay and Maps functionality within the wearable. However, the outlook of both the watches is impressive, and that earns them extra brownie points. Also, the Q Explorist features two programmable buttons placed on the right side. Regarding outlook, the Q Explorist looks more sturdy while the Q Venture is more on the delicate side and it comes in Rose Gold and Standard Gold color options with gemstones embedded in the outer ring and strap. 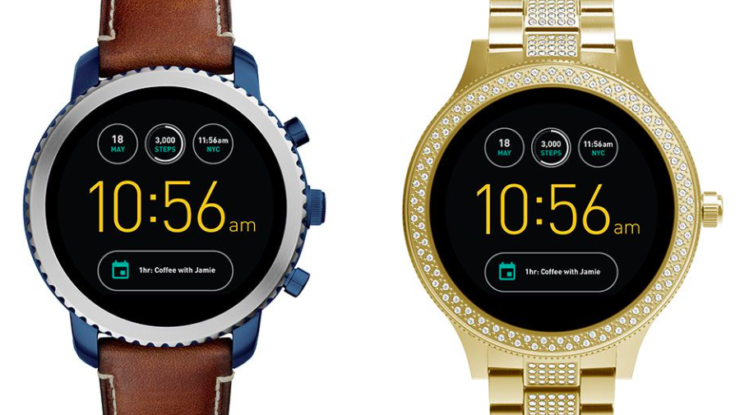 In addition to Q Explorist and Q Venture, Fossil also unveiled hybrid smartwatches named as the Q Accomplice and Q Activist. Both of these come with conventional design and watch face. They are called hybrid because within the traditional outlook, they also feature fitness tracker, integration of notification display for calls, texts, emails, and events. These two also sport programmable physical aka ‘pusher’ buttons on the side that can also be doubled up to take selfies with your smartphone or to skip/stop/play music on your phone. Fossil will put them on sale by later this year, starting at $155. With the announcement of new smartwatches by Fossil and other brands like Guess and Michael Kors, it looks like this year will be a big one for Android wearables. We can expect to witness more smartwatch launches at the ongoing Baselworld conference. What’s your take on these smartwatches that are from non-tech brands, unlike tech brands like LG, Samsung, Apple, or Motorola? Would you put your money on non-tech brands? Let us know through the comment section below.